And nothing says “see ya later low-carb diet” quite like puff pastry. Anyway, forget New Years – sitting down to this is like Christmas all over again, except this time you get to eat the wrapping paper. 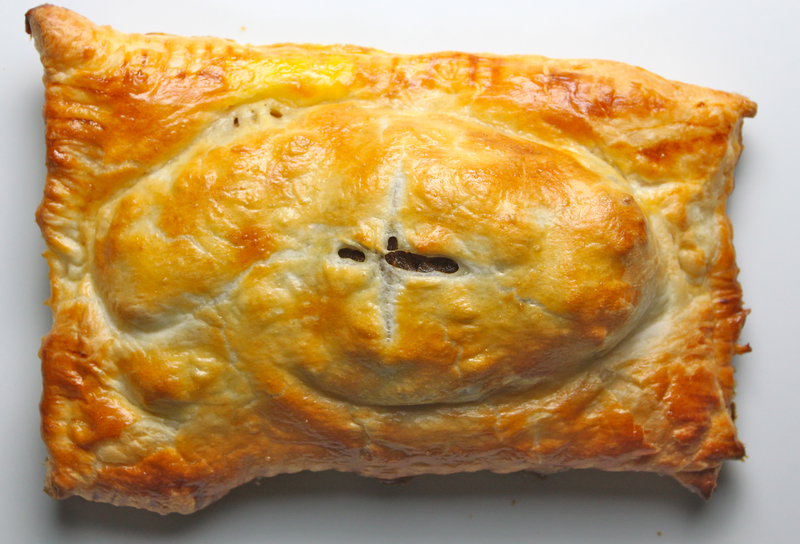 This is not the classic Wellington, made with a tenderloin roast, coated with onion, mushroom and, often, liver pâté. These are mini-Wellingtons with no mushrooms or pâté or a lot of fuss, for that matter. Instead, the simple onion coating is spiked with a little Armagnac, Cognac or brandy for richness. And rich they are! As someone who likes food, it’s not surprising that Copenhagen is one of my favourite cities. It is, after all, home to the world’s best restaurant not to mention some of the greatest beer. And, unlike Canada, where restaurants seem to close their terraces at the first nip of coolness, you can eat outdoors in Copenhagen well into the colder months – most places even supply blankets to wrap yourself in while you eat pickled herring by a canal. Sitting there among the beautiful old buildings – the canal boats, the streets filled with cyclists – enjoying a simple plate of herring, a little chopped egg, sliced onion, some sour cream and a bit of black bread, is civilization at its Danish best. Take another stroll on the Strøget! I’ve tried to recreate that mood around here with little success. None in fact. Opening a jar of pickled herring in my house is a surefire way to clear the room. Even His Majesty The Cat turns up his royal nose and heads for the hills. Which leaves me and the dog. And, let’s face it, the dog will eat anything and can’t be counted as an arbiter of good taste. Take a bit of fresh fish, however, and quickly pickle it with a little citrus and some herbs and suddenly there’s a line forming at the kitchen door. Even HMTC becomes a little purring dervish weaving about my feet. Myself, I think it’s all in the name. 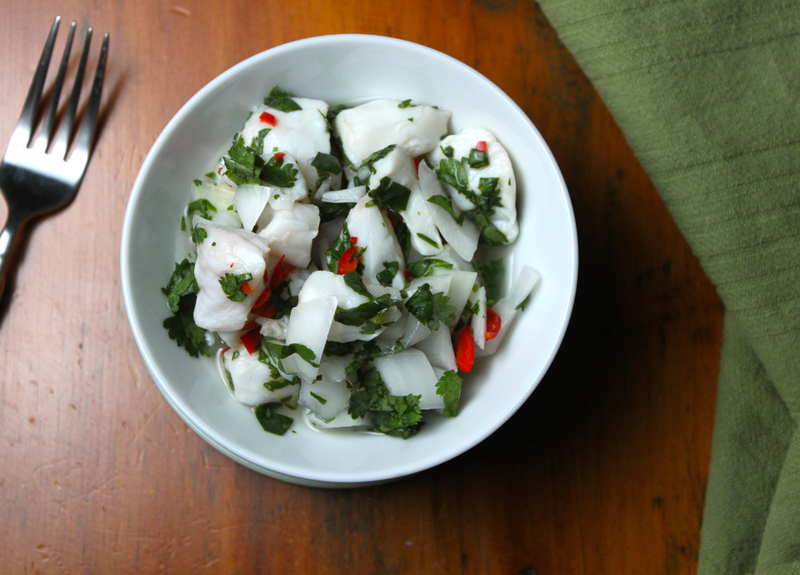 Ceviche (Sa-veech-CHAY!) just sounds a heck of a lot more je ne sais quoi than pickled herring (PICK-eld HAIR-ring!). But try telling that to the kids. We first enjoyed ceviche when graduate school friends from Chile made it for us one cold, dark Ottawa winter night a few years back (OK, quite a few years back). One bite was enough to transport us to a summer terrace in Santiago (the pitcher of pisco sour they’d also made was helpful in this regard). Salty, citrusy, just a little spicy and very fresh, the fish stays firm and meaty. It is also very simple to make – almost as easy as opening a jar of herring. Our daughter, The World’s Pickiest Eater™, consumes almost nothing I make. She will, however, devour Yorkshire pudding. I like it with mustard-crusted roast beef, mashed potatoes, mushy peas and onion gravy. Fresh horseradish, too. But she’ll ask for it with just about anything. And so Yorkshire pudding has become pretty much a staple in our house. The problem with Yorkshire pudding is that sometimes it works and sometimes it doesn’t. Light and fluffy one day, hard and dense (think hockey pucks) the next. 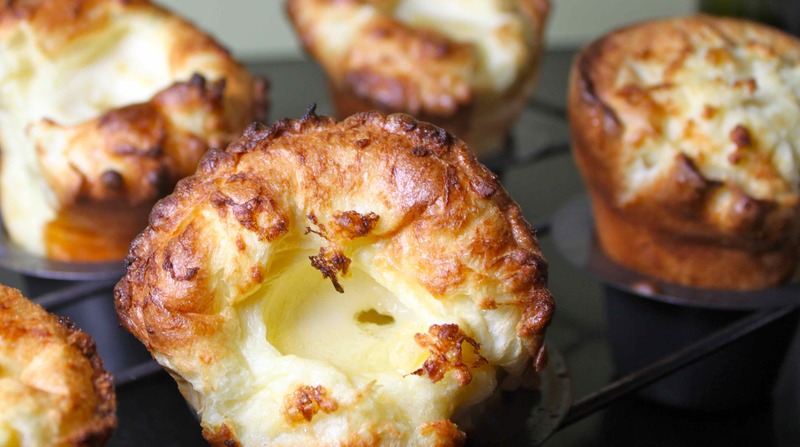 I am pretty skeptical of “no-fail” recipes (I have proven that I can make a mess of just about anything), but this simple method has produced little towers of Yorkshire goodness far more often than any other I have tried. I can’t recall where I got this recipe so my apologies for the lack of credit! Think long and hard before you make French fries this way. Once you start, there’s no looking back. Trust me. I was dubious when I saw Nigella Lawson starting potatoes in cold oil (she added whole garlic cloves and herbs near the end and called them Tuscan fries). I could only imagine soggy chips soaked in grease. It looked too good to be true. Normally, when I make fries, I par boil cut-up potatoes for five to seven minutes then let them cool on a rack. Then I deep fry them at a moderately high heat to cook them through. Back to the rack they go while the oil reaches high heat. One more fry until the potatoes are golden brown. 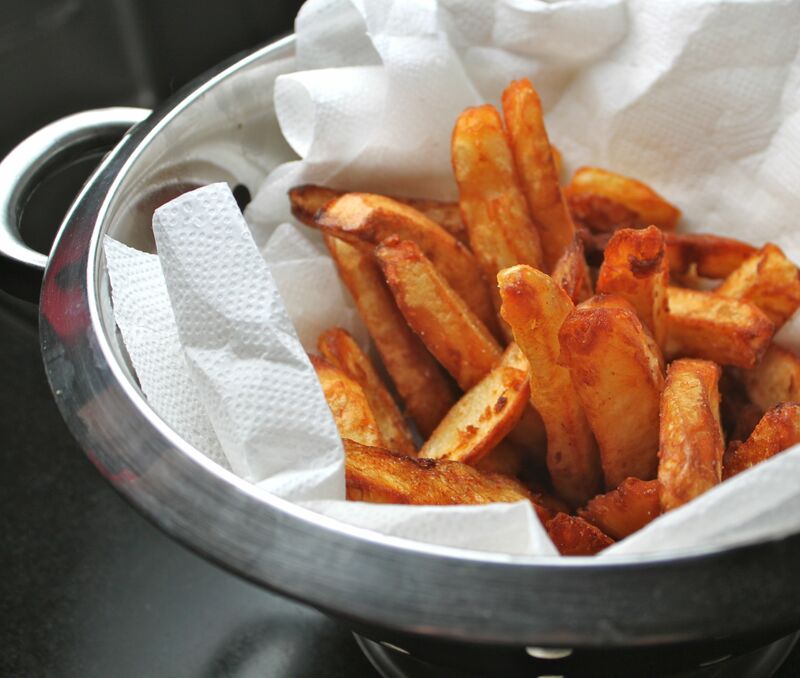 This method produces fries that are perfectly soft in the middle yet crispy on the outside. And, because it’s so much work to make fries this way, they are an occasional treat. Then I made the mistake of trying the cold-oil method. These are too easy and too good. The same soft interior of the best fries, a beautiful crunchy exterior. A fraction of the work. Now, as I think about making dinner – it doesn’t really matter what I am planning to cook – I think, I’d like fries with that. 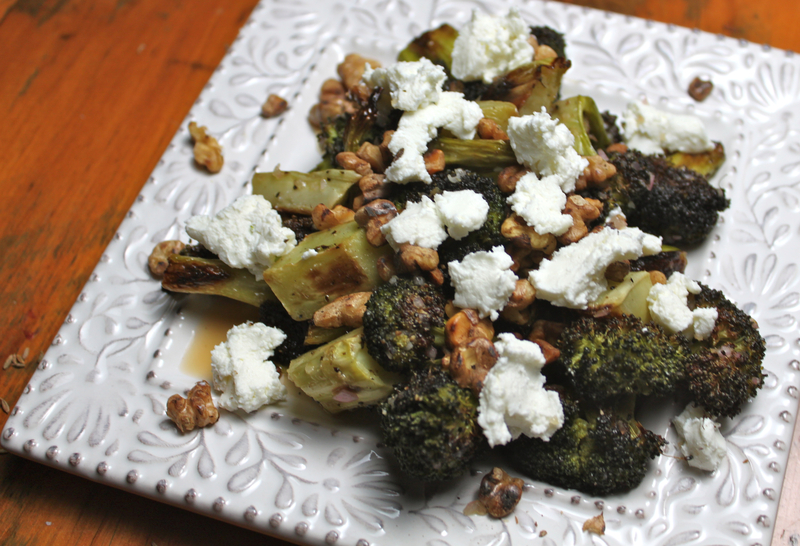 This, Mr. President, is not your mother’s broccoli. Half a week of temporary bachelorhood has restored Meats to its rightful place before Roots and Leaves. For three whole days fruits and vegetables were relegated to their proper roles – hidden in sauces and condiments – while steaks, chops and roasts have had the run of the kitchen. For three whole days the bananas turned brown on the counter, the leafy greens in the refrigerator drawer were left to their leafy green devices and the word “folate” wasn’t heard once, not even in jest. When I was a real bachelor, things were a little different: clothes were coordinated by odour rather than colour; the local Pizza Pizza franchisee depended on me to pay his mortgage; and, the Leaning Tower of Beer Bottles that occupied fully one-quarter of my one-room apartment was my idea of art. These days, I favour a more civilized pick-up-your-dirty-socks kind of bachelorhood (think English Country House rather than Frat House). Knives and forks enjoy full employment, beer is poured into glasses (or mugs if it happens to be breakfast), the empties neatly stacked out of sight. And, every steak, like the pan-fried beauty pictured above, has its sauce. I have nothing against a good old jar of HP Sauce. Lord knows, it was one of the main sources of nutrition during the boiled-mince-and-potatoes days of my childhood. Somehow, though, buying a big bottle of steak sauce – like ordering take-out – seems like a dangerous step backwards for a bachelor. The condiment aisle is a slippery slope down to the frozen food section; a little too much of the sauce and I might find myself in front of the TV, scarfing down Hungry Man Dinners in my underwear. Best to maintain control and stick to the you-can-only-eat-it-if-you-make-it rule. Otherwise, I might end up reverting to the days when I considered Doritos a major food group. Thank goodness for the folks at Joe Beef – they understand what a bachelor needs. This recipe for “gentleman” (sic) steak sauce was adapted from The Art of Living According to Joe Beef, which has to be one of the most entertaining cookbooks ever. And, I might add, they take the time to open the curtains every morning, even if it is just going to get dark again in a few hours. 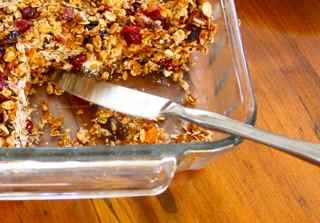 Well, it’s finally happened: we are eating homemade granola bars. Next, we’ll be “harvesting” neighbourhood squirrels for stew or buying an electric car. But, before the tie-dyed crowd starts weaving daisies into my hair, I want to assure everyone that it was my wife who made these. Not me. However, I do have to admit that, as far as granola bars go (and I’m sure that, wherever granola bars go, it’s by public transit), these aren’t bad. Chewy and crunchy, not too sweet, not too tart. After having one I almost feel like raising organic chickens in the backyard or reading a Margaret Atwood novel. Come to think of it, I’ve always wondered what it would be like to wear socks with sandals.